The new normal gets disrupted again. When it seemed like Season 1 was completely wiped away, 'Derek' reminds us that everything that happens, matters in The Good Place. The Good Place has been on a roll in its second season. 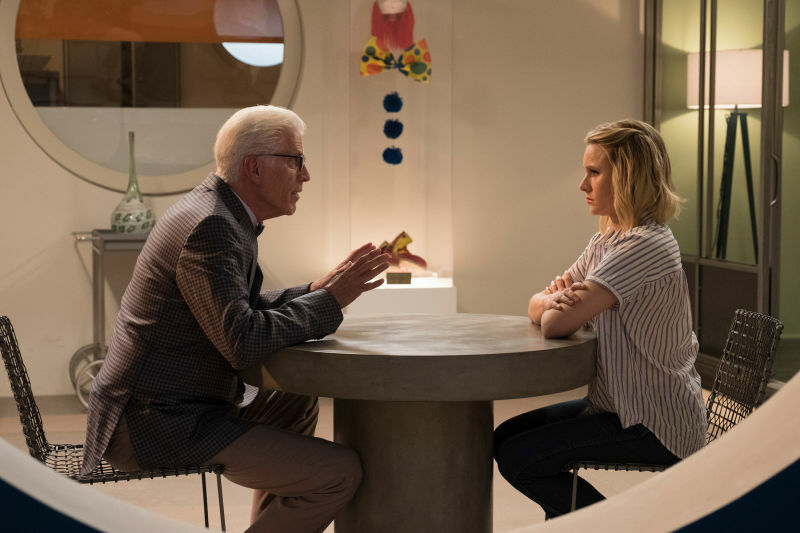 After the twist that seemed to create a lot of uncertainty at the end of Season 1, where the 'good place' that the characters found themselves in was revealed to actually be a version of the 'bad place' or hell, the show found a new normal for a few episodes in the second season. The four main characters were rebooted and the demon Vicky took control of their neighbourhood to inflict her own brand of torture on them. Michael (Ted Danson) would be in trouble if his boss, Sean, found out about the fact that his experiment had failed over 800 times, and that he had to reboot the four torturees by wiping their memories every time they figured out that they were actually in the bad place. In an effort to save his skin, he joined forces with Eleanor (Kristen Bell) and the other three humans sent to an eternity of torture in his neighbourhood after they had died on Earth. There seemed to be a new rhythm in the show, with Chidi (William Jackson Harper) giving the group ethics lessons and Michael learning to be good as they all struggled to find a way out of their bad place and into the real good place. But in last week's episode, entitled 'Janet and Michael', the show demonstrated that it wasn't ready to fall into an easy groove just yet, and a new spanner was thrown into the works. Because of all of the reboots, the Alexa-like assistant Janet (D'Arcy Carden) had begun to develop a more human side, and had emotional resonances from her previous marriage to Jason (Manny Jacinto) from their very first time experiencing Michael's neighbourhood. Her heartache at seeing Jason dating Tahani (Jameela Jamil) was causing her to malfunction and risked her destroying the entire neighborhood. Janet takes Eleanor's advice to find a rebound guy, deciding that she would create her own boyfriend named Derek, played hilariously by Jason Mantzoukas. Derek is a lovable idiot, and completely devoted to Janet. Eleanor and Michael spend the episode trying to figure out what to do with Derek and how to keep him a secret from Vicky. The bond forming between Eleanor and Michael is elevating the show in its second season, and both actors shine with the material they're given in this episode. Michael plans to murder Derek, and Chidi has to explain all of the ethical dimensions of his rash plan. The show is at its best when the characters wrestle with philosophical or ethical dilemmas, and seeing the leads wrestle about how to get rid of Janet's secret boyfriend makes this one of the strongest episodes of the season. Eleanor, meanwhile, is keeping a secret of her own, as she hasn't yet told Chidi about the many times in their previous versions of the neighbourhood the two of them have ended up in bed together and professed their love for one another. It's an element that again shows how every detail matters in the show - even in all of the reboots, there was something that stuck with the characters, something that seems to be meant to be, and it's a reminder that all of the character growth from the first season isn't lost. It'll be interesting to see where the show takes the relationship, since many fans are still shipping the chemistry between Eleanor and Tahani. The episode deals with Janet's emotional conflict well. She seems to have become much more than the robotic character from the first season, and grown into a nuanced character. At the end of the episode, she decides to decommission her homemade boyfriend Derek and send him off to a far corner of the void, accepting that there are no easy fixes for her heartache. The question remains whether she and Jason were meant to be. Michael shows just as much growth, confiding in Eleanor about how challenging it is to be ethical, and seeming to genuinely have grown close to her. But at the end of the episode, there is another cliffhanger as Sean waits for Michael in his office, looking through a stack of files, seeming to know about the failed experiment. With all of the major changes that each episode brings, there's no telling where the show will go next. With 'Derek', The Good Place goes on winter hiatus. The show will return with new episodes in 2018.